Just Jingle: A Pretty Little Alphabet Frame with May Arts and Stampendous! 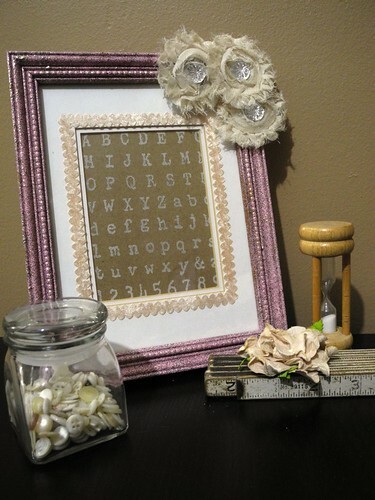 A Pretty Little Alphabet Frame with May Arts and Stampendous! It is Stampendous! week over on the May Arts blog and that means that we are combining these two fabulous companies to create some really amazing projects AND showing YOU exactly how to create them, too! And, of course, it also means PRIZES from both companies, so you simply MUST check it out! I created this super pretty little frame for a babies room by embossing a thrifted frame and filling it with the stamped image and embellishing with some really gorgeous ribbon options! You can check out the entire tutorial over on the May Arts blog along with a ton of fabulous other projects and chances to win some GREAT free stuff! I hope you are having a great week! I certainly am!!! See you again, soon! You are so talented and what a wonderful idea!!! For a babies room...a teenagers prom photo inside...a wedding shower gift. So many possibilities...thank you for the inspiration. that is beautiful! What a great idea! what a fun idea...I really love that frame...so awesome..
Soft delicate colours and a beautiful project. Beautiful project, Jennifer. Thanks for the link; I will check out the tutorial! That is such a lovely project. love this frame! That ribbon is some of my fave! I think I have a tiny bit left but hoarding like I do when supplies run low. Kinda sad huh? I love the purple frame! Very cool altered art project Jingle! That's SO pretty! Who's the lucky baby-recipient? Or is it for a baby-in-general? Well, NOT a baby IN a General. I mean ANY baby. Well, not just ANY baby 'cause that's too beautiful & special for just ANY baby. I mean ... I need some sleep. And I KNOW that YOU know what I mean. Right? Gorgeous! LOVE the ribbon flowers! What a great idea - you know how I love to monkey with old frames! Very pretty design and concept can be adapted for any occasion.